Gold Sox excited to have Mink as new GM! Former Gold Sox Legend Max Stassi hit a 12th-inning walk-off home run for the Fresno Grizzlies on Saturday night. The Gold Sox earned their second win of the weekend on Friday, defeating the Wildcats, 4-2. Louis Mejia once again led the Sox offensively, going 3-4 with 2 RBI's. Mejia once again hit a home run over the left field wall into the net, for his team leading third homer of the season. Ross Cervantes started his second game of the season, going 5 innings and allowing 2 runs. He gave up 6 hits, striking out just one batter in those 5 innings. Stuart Bradley pitched after Cervantes, where he allowed just 3 hits and 3 innings. He struck out 4 and walked one. To close out the game, Phillip Trujillo came in to pitch and struck out 2 and didn't allow a hit. The Wildcats collected 9 hits, having Thomas McMaken, Brian Bynum and Billy Salem each collect two. Bynum's first hit was an RBI single in the first inning and his second hit was a double. Eduardo Sanchez, Taylor Field and Jordan Weber each collected a single. The Wildcats' starter, Ross Clevenger, threw 7 nice innings. He allowed 4 runs on 6 hits, striking out 7 and walking 1 battter. In the 8th, Matt Thomas came in and did not allow a hit, but did walk a batter. Louis Mejia had another huge game, hitting his 3rd home run, 2 RBI's and also hit a double and a single. Ryan Glazner earned a single in his last AB, in which he would later score on a stolen base attempt. McKay Koissian singled twice as well. It was a quiet day for the Sox offensively. Stuart Bradley earned the win and Clevenger the loss. Phillip Trujillo earned the save. The Gold Sox are back on Saturday where they will face off against the Nevada Bighorns at Colusa Casino Stadium. We hope to see you out at the field. In a game with few errors and a lot of good pitching, the Sox were able to collect a win in 10 innings. In his 100th game in a Gold Sox uniform, Michael Frantz came up in the 10th after the bases were loaded. As the other man who played his 100th game this year had good luck, so did Frantz. He hit a high chopper over the third baseman's head and the Gold Sox came up with another walk off win. Chad Perry started on the bump for the Sox. He threw 5 good innings, allowing only 2 hits and 2 runs. He struck out 6 and walked 4. After Perry exited in the 6th, Kea Vierra came in for 2 shutdown innings. He allowed only 1 hit. Aaron Herr came in and would pitch the 8th and the 9th. He allowed 1 run an 0 hits. In the 10th, Branden Nunn came in to throw yet another shutdown inning. He allowed 2 hits and 0 runs. The Auburn Wildcats collected just 5 hits in the 10 innings. Thomas McMaken doubled and later scored along with Bryce Gieseke. Mason Mamerella, Eduardo Sanchez, Jordan Weber and Billy Salem each singled. In the 8th, Jake Greco reached on an error and scored on a ball hit to the wall after center fielder Ryan Glazner slid for a ball and missed. Although Greco scored, Anthony Bova, who hit the ball, was thrown out at home. Auburn starter, Garrett Pearson, threw 4 innings, allowed 2 runs and 5 hits. He struck out 5, walked 3 and hits Brandon Tripp-Cody twice. After Pearson, Jacob Call came on for another 4 innings of work, allowing just 2 hits and 1 run. Once Call left, Kevin Belivaqua came on to close. In his first inning, he shut it down, allowing a walk. In his second, he walked Spencer Lininger, Drew LaComb reached on an error and Cooper Goldby walked. Then, Michael Frantz came in and sent everyone home. Louis Mejia had a big day for the Sox. He went 3 for 5, 2 doubles, a homerun and 3 RBI. He and Michael Frantz, who only had the 1 hit, were the only ones to drive in runs. Despite that, the Sox collected 9 hits. Michael Gahan had a nice day, singling 2 times. Alex Larivee, Drew LaComb and Cooper Goldby each singled. Branden Nunn was credited with the win and Kevin Belivaqua the loss. The Gold Sox with face off against the Wildcats again on Friday. They hope to keep the winning up, and we hope to see you out at the field on Friday. The Goldsox dropped a tough one to the Pacific Union Financial Capitalists, or "Puf Caps," by a score of 4-2. The Puf Caps may have been an 18u team, but there weren't just your average high school seniors. Every player on the team is committed to a Division 1 team. 5 players were committed to Stanford, 4 to Rice and other schools, such as Michigan, Kansas, Arkansas and even Oklahoma. The Sox put up a good fight, but they couldn't capitalize on oppurtunities. The Sox seemed as though they couldn't pick up Arkansas commit, Blaine Knight. In five innings of work, he allowed 5 hits, but only one run, coming off of a groundout RBI courtesy of Alex Larivee. Knight also struck out 4. After Knight exited, Rice commit, Brent Schwarz came in for 3 innings of work. he allowed 3 hits and one run while striking out 3. For the 9th, Long Beach State commit, Chris Rivera shut the door, allowing 0 htis. Even after collecting 8 hits, the Sox could not produce runs. Michael Frantz had a nice day, goign 2 for 3 with 2 singles. Alex Larivee went 1-2 with a single and an RBI. Drew LaComb also had an RBI, going 1-3 with an RBI single. Brandon Tripp-Cody also had a two hit day, going 2-4 with 2 singles. Taylor Sanders and Michael Gahan also had a hit. Chad Perry had his first start of the year for the Sox. He pitched 4 innings, giving up 1 hit and 2 runs. He also walked 2 and struck out 2. After Perry, Ross Cervantes came in and had 1.1 innings of work. He allowed 3 hits and 2 runs while striking out 1. Aaron Alexander threw 2.2 innings, surrendering only 1 hit and striking out 3. Aaron Herr threw the 9th, allowing 0 hits. The Puf Caps collected only 5 hits, but they were able to capitalize on the Goldsox not being able to finish turning the double plays in the first few innings. Lucas Wakamatsu, Rice commit, singled and scored in the first inning. Nico Hoerner (Stanford), Jonah Davis (Nevada), and Dillon Paulson (USC) each singled. Michael Hickman (Oklahoma) hit a 2 RBI double as well. Blain Knight got the win, Chad Perry the loss and Chris Rivera collected the save. Friday will hopefully be the day that Coach Jack Johnson collects he 300th win, he is currently 299-92-2 (.763). We hope to see you out at Colusa Casino Stadium and see Coach Johnson acheive this amazing feat. Thurday's game may have been the most exciting this season. The Goldsox and the Redding Colt .45's were deadlocked going into the tenth. It also was one of the weirdest endings you'll ever see. Bases were loaded with two outs in the tenth and McKay Koissian hit a routine pop fly to the shortstop. The Colt .45s shortstop misread the ball and left fielder Guillermo Slazar dove for the ball, dropped it, and Ryan Glazner scored the winning run, stomping on the plate to make sure he scored the run. Outside of the weirdness, it was a great game. Redding's starting pitcher, Randy Wynne, threw a fantastic game. He allowed 7 hits and 1 run in 7 innings of work, while also striking out 6 batters. After he exited, Dallas Chadwick threw 2 innings of solid work while only giving up 1 hit. Toby Woods entered in the 10th inning and threw an inning and a third of work before exiting the game leaving the bases loaded for Robert Bristol. Bristol threw a third of an inning before allowing the winning run to score. Redding's only run came in the 7th inning, when Guillermo Salazar hit a massive home run over the left field wall off of Kea Vierra. Other than the home run, the Colt .45's only scrapped 3 hits. Those 3 hits were courtesy of Kyle Hoffman, Bryan Bucher and Jeff Ahern. Tyler Sharp started for the Goldsox and threw another great game. He threw 5 innings allowing only 3 hits and no runs. He struck out 5 and walked only 1. Kea Vierra threw 2 innings in relief, giving up only 1 hit and 1 run. Aaron Herr and Branden Nunn each threw an inning of relief, allowing 0 hits combined, while Nunn struck out the side in his inning. The Goldsox came up with 8 hits, but their only run came from a balk by Wynne which scored Brand Tripp-Cody. Tripp-Cody and Drew LaComb each had 2 hit games. Koissian had a single, including knocking in the winning run, and Spencer Lininger had a double. Kyle Lewis and Ryan Glazner each had singles. Tyler Sharp earned his 4 win, which ties Aaron ALexander for the team lead. Toby Woods was credited with the loss. The Goldsox will face the Colt .45's again on Friday, which is also Super Hero night. We hope to see you out at Colusa Casino Stadium. Have your group outing with the Gold Sox! Special offer on tickets for large groups! For more information call 530-741-3600! Stay connected with the latest Gold Sox News! Are you connected with the Gold Sox on social media? Follow us on Facebook, Instagram, and Twitter now! 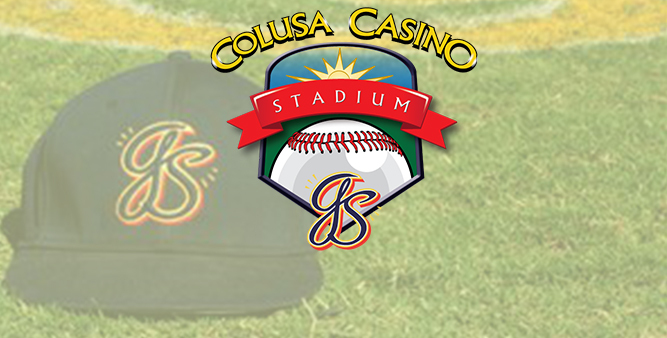 The Marysville Gold Sox (Horizon Air Summer Series) announce that they will play their 2015 baseball season at Colusa Casino Stadium. Colusa Casino Resort has purchased the naming rights for the ballpark, at 14th and B streets in Marysville.